Revised Apr 12, 2019. 97 fluids listed. Changes: Carbone Lorraine (thx to Rich S.). Added new links. Here is a comparison of all auto performance brake fluids showing cost per ounce, SKU unit size, wet and dry boiling points, compatibility with other fluids and Google Shopping links. Each column is sortable, making it a lot easier to figure out not only the best performer but the best buy for your needs. Prices on the chart are roughly current as of the update date. Shipping cost is not considered in pricing. The 'MSDS Link' column is slowly being updated to a link to the manufacturer's info on the product, where there is one. MSDS sheets are often available there. Be sure to scroll down underneath the chart. There is a complete informational article describing brake fluid terms and concepts. Have a suggestion for an addition to this page? Contact me from my byline link below. AP Racing Radi-CAL R1 3 284 516 Yes 16.9 0.59 10.05 magnesium compatible. ATE G 3 302 473 Yes 33.8 Not for sale in U.S.? Fluid DOT4 4 * 617 * 16.9 1.46 24.72 Official name is now 'CL Brakes'. Ferodo ESP DOT4 4 361 516 Yes 16.9 1.40 23.73 not sold in U.S.
Ferodo Formula 4 401 590 * 16.9 1.42 23.95 "Track Day Brake Fluid"
Gulf RF1000 4 401 617 Yes 16.9 0.88 14.93 Not sold in U.S.
Gulf RF800 4 401 581 Yes 16.9 0.81 13.73 Not sold in U.S.
Gulf Super DOT 4 4 311 446 * 16.9 Not sold in U.S.
Motorex Super DOT 4 4 338 509 Yes 16.9 5 liter cans. Low viscosity. Not available in U.S. DOT 3 & 4 4 316 473 Yes 16.9 1.74 9.70 discontinued? Pentosin Super DOT 5.1 5.1 356 500 Yes 16.9 Not sold in U.S.? TBM Brakes Xtreme 6 5.1 400 612 Yes 16.9 1.48 25.00 mfr says wet boil is "over 400"
= Sort in ascending order on a column. = Sort in descending order on a column. What Do The Boiling Points Mean? 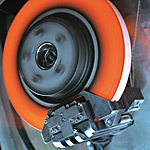 Simply put, brakes work by converting forward momentum into heat: The brake caliper - mounted on the vehicle's suspension - contacts the rotor - mounted on the spinning wheel - and squeezes it. This heats the brakes up. A lot. Heat obviously transfers into the rotors and the vehicle's hubs. It also transfers into the brake pads and - from there - into the brake caliper... where the brake fluid resides. So much heat is transferred that its possible to boil the brake fluid in your calipers. Once brake fluid boils, it creates air bubbles. Since air compresses much better than fluid does, when you press on the brake pedal you get a mushy pedal. That pedal gets progressively worse until - if you keep boiling the fluid lap after lap - the pedal goes all the way to the floor... while you keep going in whatever direction you are pointed in. At high speed. Typically for a passenger car you have to be doing something pretty extreme (as in "crazy") to boil your fluid. However if you are towing a boat or trailer you can easily put yourself into a situation where your fluid is boiling and your braking is dangerously degraded. Heavy duty brake fluid is not just for weekend racers. Further complicating the above story: Brake fluid is "hygroscopic" (commonly misspelled as "hydroscopic", which is not a real word). That means it pulls moisture into itself from the air. No matter what you do you can't stop this. Once you crack the seal on a bottle of brake fluid it starts absorbing moisture. Putting it into your brake system does not stop this process, and since water boils at a much lower temp than brake fluid does (a mere 212 degrees fahrenheit), the less moisture accumulated in your brake fluid system, the better as the boiling water in your brake fluid will create those aforementioned dangerous air bubbles. This is the temperature that your brake fluid will boil when its straight out of the sealed bottle. When there has been effectively no time for it to absorb any moisture. If you are racing on a track, you are most concerned with this value, since the fluid in your lines is likely to be freshly added. This is the temperature that your brake fluid will boil at when its been inside your braking system for a reasonably long time. How long it takes to get to this saturation point will vary by fluid type, but a good rule of thumb is the higher the dry boiling point, the faster the fluid will saturate (an informal sort of standard is - not always - used by fluid manufacturers: the wet boiling point is the reading taken after fluid has been sitting for one year in your brake lines). If you are a civilian driving on the street the wet boiling point is going to be the one you want to pay attention to since the fluid will typically stay in your brake lines for an extended period of time. Fluid with a high dry boiling point is better suited to track use. Fluid with a low wet boiling point is less suited to long term street use. The trick is to pick the points you are comfortable with, coupled to the price you are willing to spend. What Else Should I look For in Brake Fluid? For the typical weekend mechanic working on a daily-driver, simply sticking to the DOT spec recommended by the manufracturer is enough in terms of safety. You won't need to worry about esoteric things like boiling points or viscosity as the DOT standards ensure that whatever fluid you choose will meet your manufacturer's requirements. For most people the only real question is how much money they are willing to pay for their brake fluid. You can sort the chart on price/ounce to come up with your best buy. By and large, this isn't something you need to worry about. However in areas subject to extreme cold, lower viscosity is better. Since viscosity is sometimes shown on MSDS sheets (if you can find them), I may add viscosity readings to the chart above... but by and large this is a nit that doesn't need to be picked. Recently, the market has seen the arrival of ultra low viscosity brake fluids. These fluids claim to work better with ABS systems (smoother, quicker cycling) and to interact better with ESP/DSC/traction control systems. Some late-model vehicles are initially filled and dealer-maintained with this type of fluid (for example Mercedes-Benz and BMW). While the ordinary driver doesn't need to go here, your typical track rat knows this is a big piece of the puzzle. And if they don't... sooner or later they'll learn the hard way. All brake fluid resists compressibility when heated. Some fluids do it better than others. The difference doesn't have any real practical application unless you are at the extreme end of the hard-use spectrum: We're talking laps around the race track here. With that in mind you will generally find only the top-end racing brake fluids even mention superior resistance to compressibility after boiling. In my personal experience, the highest performing DOT3 fluid will still let the pedal sink effortlessly to the floor after an extreme set of laps on a professional race track. When I switched to Wilwood EXP fluid, I still boiled the fluid (to a lesser degree) but found the brakes continued to work just fine. The fluid resisted compressibility quite nicely. Note: Many if not all racing brake fluids tout the same benefit and I only single out the Wilwood product as I have personal experience with it. What is Brake Fluid Made Up Of? "DOT3, DOT4 and DOT5.1 fluids are glycol-based"
DOT4 fluid is like DOT3 fluid, with borate esters added into the mix - perhaps so much so that the fluid is now borate ester-based with glycols added rather than the other way around. Beyond the title of the specification, the SAE standard for DOT4 fluid makes no mention of preferred or required fluid composition. Like the SAE spec, the federal regulation that governs brake fluids (FMVSS116) says nothing about the composition of any fluid. What it does is dictate how the fluid must behave under a variety of specific circumstances. What About Mixing Fluid Types? Based on what we wrote up above (no regulations or firm standards on fluid content) brake fluid can be comprised of just about anything. Even so you can typically mix these fluids without damaging your braking system or compromising your existing braking performance (the list above notes some exceptions to this). BUT as nearly every brake fluid manufacturer will state: doing so is not recommended. Why? Mixing good new fluid and old bad fluid means you will retain the bad fluid's performance... its all mixed in together and the old fluid will still boil merrily away, giving you exactly what you had in the first place. You can't fortify it with an injection of the good stuff; you need to completely flush out what you have and replace with fresh fluid. So, while you won't hurt anything by topping up your brake fluid (which you should do if it runs low for some reason), you aren't gaining the benefits that go with a complete flush of the system. My Favorite Fluid Is Unique And Special, Right? Mayyyyybe. Truth be told many of the fluids in the table above are made at this factory and put into different bottles with different labels. I'm not naming any names so don't bother asking. There are several brake fluid comparison charts out there on the web, on personal web pages and in innumerable forum posts (thats how this page started out life, back in 2009). Nothing on this list got here unless I was able to confirm specs on at least the manufacturer's site or, in the rare case that failed, multiple vendor sites. In the few cases where I can see a brake fluid on a manufacturer's site but a) cannot find it for sale in the U.S. and b) the manufacturer is extremely vague on its properties (as in this example - the linked technical datasheet has entries for the boil points... and they are blank). I may opt to leave the fluid out of the list. I do not use vendor/seller web sites as primary sources of information - Over time I have found a LOT of them to be inaccurate - especially with regard to keeping up to date on specs that may have changed. Beginning in 2016 this page receives so much traffic I am expanding the list to include general consumer automotive brake fluids, with the idea being a consumer with a nicely spirited street vehicle - not necessarily a track rat - might want to pick and choose the best brake fluid. With this in mind I have opted to exclude DOT 3 fluids in this addition. Given the above this list should be the most accurate brake fluid comparison chart on the web. I would like to keep it that way so if you have different information than I put up here please let me know what you have found. I am not including silicone-based DOT 5 fluids as they are outside the mainstream. Think I'm wrong? Feel free to drop me a line and convince me otherwise.